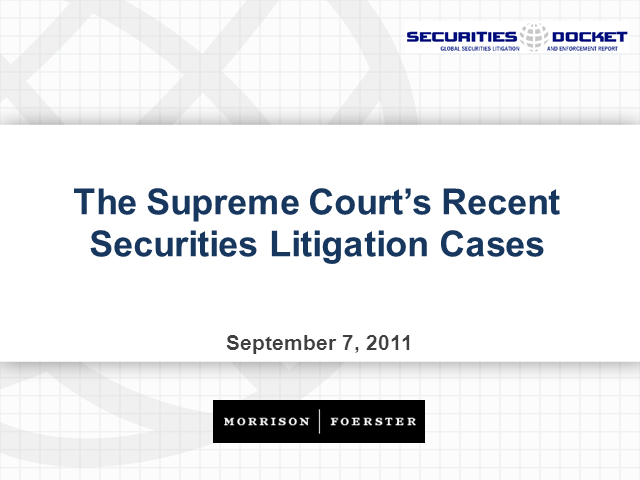 In recent years, there has been an uptick in the number of securities cases that the Supreme Court has reviewed. Last term alone, the Supreme Court decided three securities cases. Matrixx Initiatives, Inc. v. Siracusano examined disclosure obligations and the contextual nature of materiality. Erica P. John Fund, Inc. v. Halliburton Co. confronted the interplay between the elements of reliance and loss causation at class certification. Janus Capital Group, Inc. v. First Derivative Traders limited the reach of primary liability in securities fraud cases to those persons and entities who make or control the content of a public statement. In the coming term, the Court will decide Credit Suisse Securities v. Simmonds, which presents questions about the statute of limitations for and tolling of claims under Section 16(b) of the Securities and Exchange Act of 1934. The webcast will examine the Supreme Court’s recent decisions, highlight trends, and assess how these decisions may affect securities litigation going forward. This webcast also will explore the possible reasons for the uptick in the number of securities cases on the Court’s docket, and explore the importance of the Court’s docket to the business community. The panel will consist of Jordan Eth and Deanne E. Maynard, partners at Morrison & Foerster LLP. Mr. Eth is Co-Chair of the firm’s Securities Litigation, Enforcement, and White-Collar Defense practice group. Ms. Maynard is the chair of the firm’s Appellate and Supreme Court practice group, and a former Assistant to the Solicitor General at the United States Department of Justice. Mr. Eth and Ms. Maynard have authored several amicus briefs in securities cases pending before the Supreme Court.